Fascinating pen, Dan! Congratulations on your newest acquisition. Correction! The pen only comes in silver, gold and platinum. The platinum is only available as custom order. Thanks. How much does Jules cost? Is it really as much as half of Dr. I’s collection? Jules has genuine gemstone eyes of red rubies or blue sapphires, weighing 1.5 carats. Fountain Pens and Rollerballs are the same price. Delivery time is currently approximately 4-5 weeks. Edited by Joyce, 25 March 2007 - 17:06. You know you're hopelessly deep into this hobby when you read the price of this pen and say to yourself, wow, that's a great price! Really, if you look at some of the super high end pens like Michael Perchin and David Oscarson, then this pen is a bargain. Now if I only had a few thousand $ lying around. Thank you everyone for your encouragments on our first pen! Edited by Jeff Boschert, 17 August 2007 - 03:11. No kidding!!!! I agree completely. When I started this little trip, I would look at $200 fountain pens and attempt to comprehend why anyone would spend that much on a pen. Now, I look at my collection and rationalize by thinking that I haven't spent as much as person "X" on this website, so nope, I'm not a pen-junkie. By the way, my definition of an expensive pen (in my small world) now begins at several hundreds of dollars more. Gees!!!! Where's Winedoc?, my fingers are startin' to itch again, needin' just a taste of some new ink, hold a new pen, hands startin' to shake..... hey, I don't need it, I can stop purchasing pens at any time. Yeah, that's right! Dan, I'm very glad you copied your review to FPN--I think you did the pen (and its artisans) a great service. It needs to be displayed! And... I'm quite jealous. I am amazed at that wondeful work of art. I wish I could own one... perhaps in the distant future. Certainly, these will survive well past our lifetimes. Edited by jd50ae, 16 March 2007 - 13:54. Uh-oh. I don't think this is going to pass the Mrs. Kenny test. 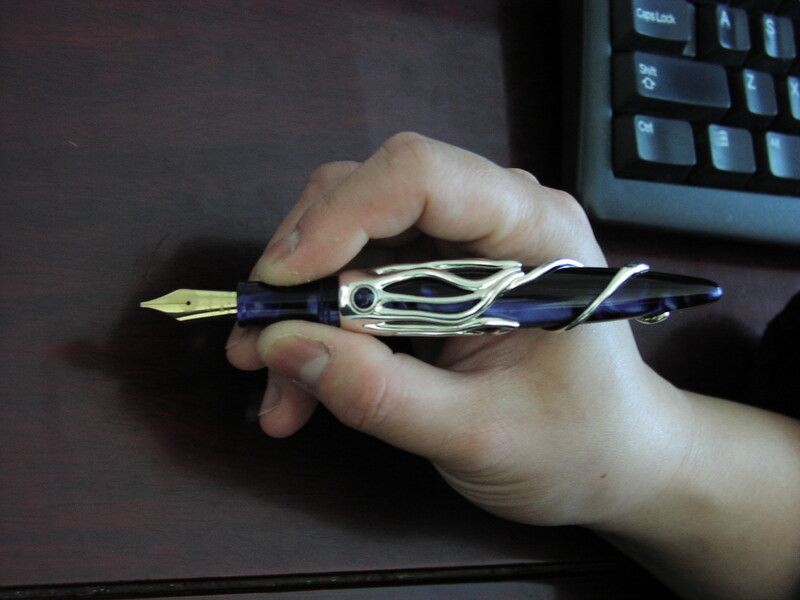 When I stated in the "another" discussion that I thought "Jules" would be difficult to use because his little eyes would get in the way of my grip, a photo was posted by the manufacturer and they stated that the "eyes" were 90 degrees out of alignment from the nib, so they would not interfer. But the "Review" that started this all out has a photos that shows the "eyes" are inline with the nib. Does the nib rotate like a Parker 75? I can make it anyway you like. I prefer it as in the following photo. Edited by Jeff Boschert, 17 August 2007 - 03:12. When my photo was originally made, I was playing with different settings for the nib, so you are right about how the nib was set in those photos, of course. Since then I've settled on the nib position show in Jeff's photo above and I do prefer that, although I cannot say that the other position bothered me. The nib does not rotate by design like the 75 did, but the nib unit can be set into the section at the angle desired. I'm taking a break from writing a letter to Australia alternating between a MB 20 Safety and Jules (or Squidwort, as he's known around this house!). Fun, especially on the ultra-thin Crane's airmail paper!